Brian Saybe, 55, has been an architect for the Veteran's Administration Medical Center in Alexandria, Louisiana for 19 years-and shared his designs with the private sector for a number of years prior to that. Saybe contracted polio when he was just three months old. The disease left him with paralysis in one leg, and he began wearing a KAFO (knee-ankle-foot orthosis) to provide support for that leg when he was 3 years old. His first pediatric brace was fitted by Snell's 52 years ago, and as he has grown and matured, Saybe has seen orthotic technology and techniques grow and progress, too. "When I was a small child, the braces were very much different-mostly heavier steel. Over the years they have developed some metals and plastics that are just as strong, but much lighter." Saybe describes himself modestly as "Fairly mobile," but then adds with confidence: "I do most anything I want to do. Around job sites, I'm not as adventurous as I was a few years back," he smiles, "but if I need to get anywhere, I can get there." In his leisure hours, he swims frequently for exercise, and includes his wife and two daughters in his fishing and hunting expeditions. 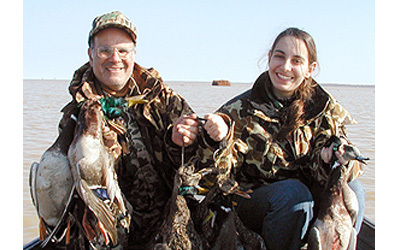 "Only one of my daughters likes to hunt, but they both enjoy fishing, so we often visit our camp in LaSalle Parish." Of his life and limitations, Saybe says, "I've always felt that I've been gifted in what I've been able to do. My handicap never stopped me. It might have made me take detours, but if there was something I wanted to do, I always found a way. The neighborhood kids all played ball together, and they just accommodated my needs. In baseball, I would hit the ball, but the fellow standing next to me would do the base running for me. "I was very lucky-I was mobile enough to do things, and I was always surrounded by family and friends that never wanted to exclude me, and never felt it was necessary. We always made accommodations that let me do what I wanted to do." He recalls a story his mother used to tell: "I went to a Catholic school, and once, when I was in the second or third grade, my mother got a call from a frantic nun who told her that I had climbed to the top of the monkey bars-and she was concerned that I was in trouble. "My mother just said calmly, 'Well, if he climbed up there, he can climb down, so don't worry about it!'" Saybe thrived, in part due to his mother's great attitude: "She used to talk about the doctor we visited who said that I would never walk. She dumped him in a hurry and went with one who offered a little more optimistic prediction!" century, and of the role they have played in a lifelong relationship, Saybe says simply, "Basically, they have made me mobile. Once I got into a brace, I've been able to be mobile and do everything I wanted to do."